Sunday Morning Sniffles | Yo, Yenta! Today was the last Shalom School session of the year, and though I am verrrry much looking forward to spending my Sunday mornings contemplating the ladybugs on my favorite dahlia plant instead of herding a gaggle of 5 year-olds into submission with promises of challah and stickers, I sure am gonna miss those little kinders. I’m feeling fairly farkelmpt about it, in fact. No more “David Melech Yisrael” handjive or knocking down the Tower of Babel made of wooden blocks. Or giving in to the roaring hilarity that, yes, Adam and Eve were in fact, NAKED. And where else can a grown woman hoard glitter and crayons without attracting the attention of the authorities? One of my favorite parts of Shalom School is coming up with crafts made out of cheap (ahem, free) everyday objects. Last week we learned about Shavuot a little early with some brown lunch bags and what I consider to be the best invention given to humankind since the Torah: Glue sticks. First, we crumpled up the bags to make them look really, really old. Then we cut them into tablet shapes, just like the ones Moses shlepped down from Mount Sinai, only much lighter. 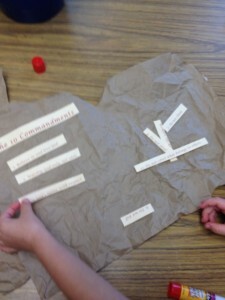 Then everyone had to glue down the 10 Commandments in order, which sounds easy but you’re not in kindergarten, are you? Another one of my favorite projects is making mezuzot out of tongue depressors and cardboard tubes that come from the bottom of drycleaner hangers that I filch from the dumpster. This may sound sacreligious, but when all is said and done, these Jewish kids have a mezuzah for the doorposts of their bedrooms, which everyone knows keeps out the monsters. The scroll gets tucked in the top, see? Even though the prayers are only copies, not the fancy kosher parchment kind, I still counsel the kids that the words are precious and should be treated with respect. Unless they want the monsters to get them. Just kidding. Maybe. I’m sharing these with y’all in the hopes you’ll pass them on to Hebrew school educators everywhere, as I don’t foresee supervising these projects anymore as I am officially retiring from teaching kindergarten. If anyone’s interested, I also have cheap-n-awesome seder plate craft that I’m happy to share. But just because I’m hanging up my rounded scissors doesn’t mean I won’t be teaching Shalom School come next fall. I will be–to the seventh graders. A bunch of brainy, too-cool-for-shul, b’nai mitzvah know-it-alls. Sure, they may read Hebrew way better than me and can talk d’var Torah like other kids analyze their friends’ Facebook updates. But if they think they’re too old for glue sticks and glitter, they don’t know the Yenta, yo. I bet you are awesome! We still have Sammy’s tongue depressor mezzuzah on his door. Glitter and all. One of our favorite pieces of Judaica. Tru has both crafts proudly posted in his room. You make a big dif in the life of these kiddos. Glad you are hanging around the Shalom School, no matter what the age.